Saturday, June 4 from 10:00 a.m. until 6:00 p.m. The first Japan Block Fair of the season is this Saturday! 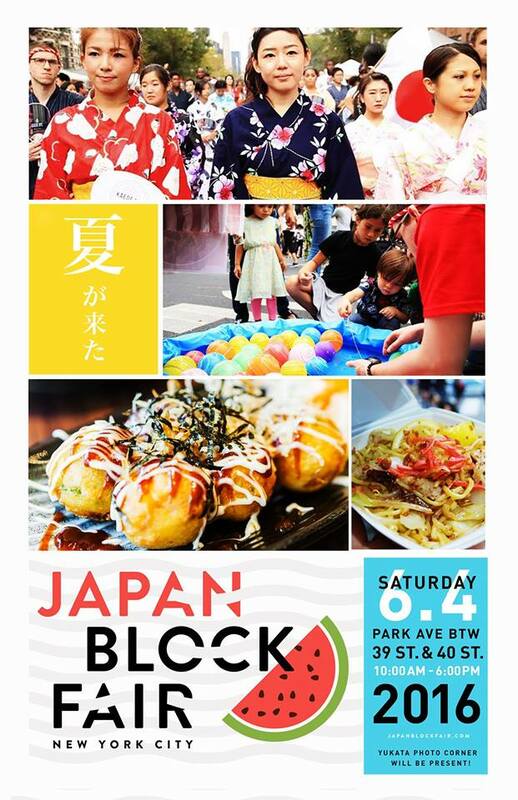 Japan Block Fair aims to introduce New Yorkers to the variety within Japanese culture by hosting street fairs at various times throughout the year. As always, there will be Japanese street food, prepared by some of the best vendors in NYC. There are a few new vendors that you must try. You’ll also be able to purchase Japanese products such as tenugui, pottery, and clothing. You can try on a yukata and have your photo taken at the Appare Japan booth. The New York Japanese American Lions Club will have a fundraising area as well. Never been to a Japan Block Fair? Check out JapanCulture•NYC’s Flickr page to see photos from past events! For updates, please visit Japan Block Fair’s Facebook Event page.